MINNEAPOLIS — (May 2011) — Katun Corporation, one of the world’s leading alternative suppliers to the office equipment industry, is proud to introduce Katun® Performance™ monochrome toner for use in Ricoh Aficio 1022/3025/MP2510/MP3350-series digital copier/printers. This toner provides a reliable alternative for Ricoh dealers seeking to boost profitability of their Aficio 1022-series, Aficio 2022-series, Aficio 3025-series, MP 2510-series, MP-3010 series and MP 3350-series machines. This high-quality monochrome toner has been rigorously tested by the Katun laboratory under extreme usage and environmental conditions. These test results prove that the Katun® Performance™ toner provides OEM-equivalent performance. In addition, this toner has been tested and approved for forward and reverse compatibility with OEM toner, therefore this Katun® Performance™ toner can be installed before or after OEM toner, with no degradation in copy quality. 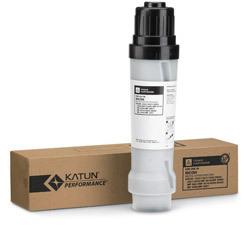 As with all Katun® Performance™ products, this monochrome toner may be ordered via the Katun Online Catalog – Katun’s one-stop Internet resource that allows registered customers to locate and order thousands of Katun products while accessing real-time information about their orders and accounts. Customers can access the Katun Online Catalog at www.katun.com. Headquartered in Minneapolis, Katun Corporation is one of the world’s leading suppliers of OEM-compatible imaging supplies, photoreceptors, fuser rollers, parts and other select products and services for the office equipment industry. With more than 30 years of expertise, the privately held Katun now serves more than 16,000 customers in more than 135 countries. For more information, visit Katun online at www.katun.com.